The Foundation provides accommodation for infirm ex Service people and those who have served in the Merchant Navy. It was founded on 20 November 1946 and because of its rather long official title it is more usually referred to as "the E Hayes Dashwood Foundation" or, more simply, "The Dashwood Foundation". Between 1896 and 1916 the founder, Edward Hayes Dashwood, built a considerable number of flats and houses in Balham on the site of a farm – known still today as the Hyde Farm Estate. Although at that time the area had not yet become engulfed by London, the need for housing was already increasing dramatically. Records show that the first Service people in residence on the estate were Boer War and First World War veterans who occupied as tenants of Mr Dashwood from 1916 onwards. The D-Day Landings were undoubtedly among those actions which inspired Mr Dashwood to set up the Foundation and to endow it with the properties from two of the roads on his estate. 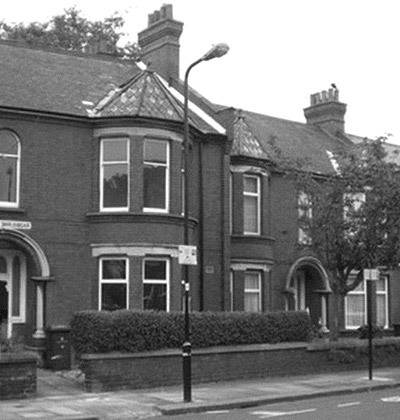 The two roads, Radbourne Road and Telferscot Road, comprised 176 leasehold self-contained units, consisting of one, two or three bedroomed purpose built flats on ground or first floors. All flats had their own small garden, accessed by a rear outside staircase in the case of the first floor flats. Whilst the phrase "homes fit for heroes" might be considered too grandiose, the flats nevertheless make very good homes and have generally lent themselves well to the process of improvement to modern day standards. The beneficiaries of the Foundation's charity were stated, in the legal format of the time, to be "for wholly or partially infirm suffering stricken wounded or otherwise infirm men who have served as officers or non-commissioned officers or in any other rank in the Royal Navy or His Majesty's Army, the Royal Air Force or the Mercantile Marine whether their disablement arises directly or indirectly from wounds accidents disease or otherwise". Although it was not mentioned in the original deed, the Founder was a keen advocate of independent living. He referred to those qualified as his Guests and they are still referred to by that name today. Amongst the Governors in the early years were some who had become household names in the preceding conflict; the most well known of these was Douglas Bader. There has always been a strong representation on the Board of Governors from each of the four Services and there is a debt of gratitude to those of them who, some 35 years ago, secured long term protection for the Foundation by the purchase of the freehold of all the endowed properties. Since that milestone the number of Guests which the Foundation accommodates has risen steadily from less than 40 to its current level of around 100. The average age of Guests has increased over time with Guest applications coming almost exclusively from those who had served in the Second World War. In recent years, though, there have been younger applicants from those who have served their country subsequently and the age range is widening.